Up at 3:45 to drive the hour over to Hell, Michigan and be there early for a six o’clock race start. I packed all my stuff last night in order to avoid groggy-morning forgetfulness, like water bottles, or VFFs, or an extra truck key. Anything. I’m capable of forgetting anything at these hours. All I have to do is just get up, make myself a breakfast, and go. I’m looking for a little redemption after my DNF on the Burning River 100 Miler earlier this summer. Since I DNFed at Mile 70, I’m fairly sure I can finish a 50 Miler. Still, I want to apply a little of what I learned on that experience for this one, mainly in the area of nutrition. I really want to be better about keeping my salt/potassium levels up, so yesterday I was adding extra salt to my food, and ate a couple bananas (which I don’t normally eat) and this morning I eat another banana. I’ve also bought a couple strawberry/banana smoothies to drink during the race, which I’ll keep in my gear bag. I’ve also bought some salty products to nibble on, unsure of what will be available at the aid stations: some Triscuits, and some pretzel rods. But my latest experiment, nutrition-wise, is ‘Clif Shot Bloks’, which are supposed to work the same way those ‘Gu’ packs, but taste way better, like gummi bears. I’m not exactly sure if the effect is psychological or not, but using them for my longer runs, there seems to be an effect. Anyway, I have two packages’ worth with me, which I’ll carry in my shorts pocket and nibble upon along the way. The weather is cool, but not too much so, so I’m wearing my compression shorts, with another pair over the top, along with my amazing wicking t-shirt, still going strong after years. I’m still kind of debating footwear, or even wearing footwear period. I ran the 50K at this place barefoot, but they were pretty raw by the end. Just like at Burning River, I’m thinking I’d just like some protection for this longer distance, so I’m going to wear my VFFs, though I throw my huaraches in my gear bag just in case. I’m also thinking of maybe running the first of three loops of the race barefoot, just because, especially now that’s there’s a little rain, and the trails will be soft and muddy. I’ve been debating whether to use minimalist footwear on longer runs or not. It’s a question of speed versus purism/injury potential: Someone like Barefoot Ken Bob would say that we shouldn’t run races we couldn’t otherwise run barefoot, because of the chance of injury from our feet being desensitized while covered up. On the other hand, I know that I run way slower while barefoot. 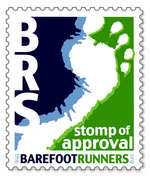 I too thought I was a purist until running the Pinkney Trail Marathon barefoot last Spring. It was rocky, and slow going, and though I finished, I finished almost at the very end, and my feet hurt anyway. Another rule of Ken Bob’s is to make sure you’re having fun, and to me, finishing towards the back with my feet still hurting just isn’t fun. I know I’m not going to win any races, I’m not that fast, but I enjoy being in the ‘pack,’ both for the mini-competitions that develop, but also being part of the collective pushing of each other’s boundaries that happens in any race. The long dark drive over on Michigan back roads is confusing, just like last year, and just like last year, I get slightly misplaced, but eventually make it into Hell, and then beyond up into the Hell’s Creek Campground, where then races start. Unlike the rest of the surrounding countryside, the camp seems alive with activity, with lights and generators going. I’d hate to be camping out here, though many people are. The local chain of running stores, Running Fit, is hosting a weekend of race mania, all around the them of the 60s Woodstock concert, so many employees and attendees will be dressed in hippie garb, like tie-dye shirts and dresses. The 100 Mile and 100K races actually started last night, which I like the idea of, since they were running in the dark at their strongest fitness levels. The 50 Mile race is the first race this morning, and an hour or so after us the marathon, half-marathon, 50K, and 5 Mile will all start. I think there’s even a 5K planned for later in the afternoon, as well as one tomorrow, for those who stay the night. And when I pull into the parking area it’s raining again. Hm. I put on my rain jacket, wondering if I should maybe wear it for the run, though that would probably make me sweat and get just as wet in the long run. But as I walk from the parking lot to the registration area, the drizzle lets up. Kinda hard to believe that the 100 Milers and the 100Kers have been running all night. I go into the runners tent, the floor of which, the grass, is soaked. And a runner comes in off the course, looking exhausted. “Congratulations!” says one of the organizers, “You came in fourth!” Wow, I’m assuming she has run the 100K, but even then, wow. Her whole race was basically in the dark. Wow. There are other 50 Milers puttering around like me. Not a lot of places to sit, since everyone is putting their gear bags on the folding chairs to keep them out of the water. And I don’t just mean the grass floor is slight wet or dewy, it’s sopping, and squishy. Fortunately the organizers have found a large piece of plywood and put it in one corner, so I put my bag there, though even then water is oozing out onto it. With the cloud cover, the course is going to be dark. It the skies were clear, I’d consider not starting with a light, but for this I’ll carry a flashlight, which fits handily in one hand, balancing my water bottle in the other. Running in the dark convinces me that I need my VFFs. Running barefoot in the dark on rocky trails with only a flashlight does not sound like fun. And, there’s no getting around it, we’re going to get wet, so no sense trying to stay dry here. So, I put on my Injinji socks, and then my VFFs, and step on the grass and feel the wetness ooze in. But outside the rain has stopped. Conversation consists of speculation on how much rain we’ll get. Most people seem to feel the rain will have stopped, with maybe another shower in about three hours. Wandering around near the start line, I spot another set of VFFs, and the woman’s hair looks familiar: Is that Jocelyn from the BRS site and from the Naked Foot 5K a couple weeks ago? It is! Only she’s kilt-less this time. Humorously, we end up comparing VFFs right in from of the Running Fit owner, who doesn’t seem to be amused, even though Running Fit now stocks VFFs. He seems to frown and be annoyed and walks away. Lace up, dude! This is one of about 20 zillion races I’m doing this Fall, and some may wonder why I’m doing so many, especially since they cost money, and I could be doing other things, like having a social life, and/or playing more music, or having more time to write even. I guess my answer is that I feel alive when I run, both on my own, and in a different way when I ‘race,’ though I’m not sure race is the right term for these things. I kind of feel like these are ‘rituals’, or at the very least re-enactments, of some long gone primal activity, when we were all persistence hunters, before we invented the spear or the bow and arrow, and the whole tribe, women and children included, would spread out and run animals down until they dropped. Yes, I am competitive, and feed off of challenging myself against other runners, but really I feel like these ‘races’ are collective experiences, where we collectively push ourselves physically, learning from and, really, helping each other. But speaking of a social life, another reason to run in these things is the hotties in tight running shorts. It’s not that I have a preference for a certain body type, I don’t, but any athletic woman in tight running shorts just looks amazing, like the one standing in front of me right now, in a blue sports bra and black shorts, with a few visible tattoos, including one kind of flowery design on the back of her neck. Lovely. Unfortunately, running is like writing and tends to be a solitary activity except for tribal gatherings like this. How then shall I meet one of these fit lasses? But now we’re gathering for the start. I don’t pretend to even think I’ll be fast, so I go towards the middle. There’s maybe 50 of us, maybe a little more, but it’s one of the smallest groups I’ve run in. The marathoners and half-marathoners and the 50Kers will be starting later. For at least a couple hours it’ll just be us and whatever 100 Milers we come across. Us ultramarathoners are running a different route, of about 16.6 miles. The 100 Milers will run it six times. Us, three. With the 100Kers and 50Kers taking special short cuts on their respective last loops. The Running Fit owner counts us down and we’re off! Up a gravel road, past tents and some port-o-potties and then cut into the woods on a trail. There’s surprisingly not a lot of jockying for position, at least not back here. And the trail is muddy. And I mean muddy. Like, basically no traction muddy. Like, in danger of falling on my face muddy. I hear exclamations of surprise and frustration all around. We’re running through puddles, and now it starts to pour. If my VFFs were damp before, they’re now soaked. Weirdly, when I look back, the whole back half of the runners seems to have vanished, I guess totally slowed down by the mud and rain. And, after passing a couple of people on muddy downhills, where I just go balls out, I find myself alone in the woods. Like, after five minutes. Everyone ahead seems to have vanished. I can’t see any lights. And no lights behind me. If it weren’t for the plethora of pink flags on the trail I would think I’d taken a wrong turn at Albuquerque or something. I’ve never seen runners dispersed out so quickly. So we run like that, even when we pop out onto the sandy bike/horse trail straight-away that I remember from last year. I pick up my pace a little bit, while still trying to keep a good running form, and she stay right behind me, which feels weird, since the trail is wide enough for about four runners. I normally don’t like when people ride right behind me, but since she’s so attractive it doesn’t annoy me, just confuses me, as women are wont to do. I try to start a convo, just basic questions like if she’s run this before, and where she’s from, which, alas, is like two hours from me. Sigh. She just gives short monosyllabic answers, so I don’t want to seem like the overly-talkative guy trying to hit on her (even though I guess I am), so I just keep running and she keeps right behind me. We do encounter other people finally. One guy we catch up to, who’s driven over from Wisconsin to do this. Another comes up on us and runs with us for a while. Also, we’re starting to find 100 Milers, who are somewhere in the later stages of their races, and now walking like zombies, all of them with plastic parkas that the race officials must have given them. I say hello to all of them, and they do reply, but they have that look, that exhausted-beyond-coherence look. I ask one guy if it’s been raining on them all night, and he says, ‘Yup.’ Wow. That’s a long cold night. The bike path route keeps going for the marathoners and co., but for us ultramarathoners it cuts left back on a trail into the woods. The guy eventually passes both of us, though we follow him for a while. The course is wonderful, especially now. Just so quiet. Though I don’t like getting up early, now that I’m out and running my body feels electric. Birds are starting to wake up, but mostly what I hear is the rain, falling on the leave and trees and ground. And me. This section of trail is more sandy, so it’s nice and soft without any loss of traction. The rain feels good on my face, and I like the musty wet forest smell. I have no idea how many miles I’ve run, and I’m trying not to look at my watch timer, just to run for now. We get to the first Aid Station, a big tent seemingly in the middle of nowhere, but with a big table full of drinks and nibbles. I make sure to have a couple Gatorades, and then to eat both a piece of potato dipped in salt and a couple banana pieces, trying to keep that salt/potassium intake going, even, and maybe especially, at the beginning stages. Then I hear, “John!” I look up at the group of guys standing off to the side, and who should it be but Jason Robillard! He’s not running, so I ask him if he’s pacing somebody, but turns out his wife Shelly is running this 50 Miler. I dawdle a little, wondering if I should eat something else, then turn to go, and realize, and I swear I’m not making this up, my lovely companion seems to be stalling, ready to go, but waiting for me. Wow. How odd. So, not wanting to just start running without at least acknowledging her presence, I say, jokingly, so if it’s not true she doesn’t have to feel awkward, “Ready to go?” And she says, kind of monotone, “Yeah.” Ok, so she’s not totally excited maybe. Who knows. Ok, well, again, I’m not going to be ‘that guy’ that likes to talk women’s ears off. So, I’ll just run. More mud. More rain. Not heavy, but a steady drizzle now. Just feels like it’s going to be going all morning. There’s not wind, so the clouds are just going to sit over us. It’s at least light now, so I can turn off my flashlight. We dump out onto a larger gravel road, and I again am grateful that I didn’t try this barefoot. I know Barefoot Ken Bob says to go out and have fun on gravel, but I don’t. Maybe if I lived near some I’d play on them more, but as is, I can feel the pebbles even through the VFF soles. And we go a while on the road. The Wood Nymph follows behind me until I slow down and move to the right, trying to show her that she’s welcome to run beside me, which she does for a while, though we still don’t really talk, until some confusion occurs: We see people coming the other way. We wonder if we’ve taken a wrong turn, but turns out that this portion of the course is two-way, and we’re seeing both some more zombie 100 Milers and now some of the faster 50 Milers. After some time, I’m not sure on distance traveled at all, we cut back onto a trail to the left. The Wood Nymph motions for me to go first. “You’re probably faster than I am on trails.” I’m not sure about that, and I think she really just wants to pace off of me. Kinda weird, since I feel like I’m running maybe a little faster than normal, and therefore I’m not sure how long I can keep it up, whereas I get a feeling she’s pacing herself and could be going a lot faster if she wanted. But we get to another aid station, the farthest one out on the course, and again, she seems to stall, waiting for me. After more salty potato and a whole banana I set out, though also noting a couple quiet runner guys hanging out in the tent, looking just beat. I realize that they’ve probably decided to stop and are waiting rides back to the camp. Well, I know how that feels, and I would not judge them at all, especially not in this everlasting rain. I just feel bad and want to tell them that it’s ok, that they’re awesome for getting that far. Anyways, onward. We seem to be more in a mix of 50 Milers, coming back along that two-way section, where, surprisingly, there are still folks heading on their way out, which makes me feel decent that I’m not way at the end. We even get passed by some fast guys, making me suspect that they’ve lapped us already. Is that possible at this point? What the hell? Never have so many people known my name in a race. It’s Mark, my coworker and runner extraordinaire, who actually finished 10th at Burning River. He’s running the marathon. We weren’t sure if we’d actually see each other, but here we are. He pats me on the back, we say hello, and he’s off, before I can even ask him how far he’s into the marathon. The dude is fast, so I’m thinking at this point he’s already on his last loop. He’ll be home grading papers before I’m half-way through with this thing. With all the coming and going of runners, I take a look back and see that The Wood Nymph has fallen behind ways. We make eye contact but I’d feel weird waving or something. Well, these things happen in long races and I’ll probably see her later on. I catch a bite of conversation between groups going in opposite directions, since apparently someone just ahead of me is wondering what’s going on too, and the woman, in a group of three, who replies says that they’re half-marathoners, but that they went the wrong way by accident. Hm. Odd. The trail comes to a ‘T’, but there at the end of the trail is a sign that says, “IF YOU CAN READ THIS THEN YOU’RE LOST.” What? And, everyone around me is having the same reaction. We all slow down, and even stop, trying to figure out what’s going on, because right past that sign are flags of all colors, meaning for all the different distances, lined up and going to the left. But a group of three young woman are talking right next to me, and one of them seems to be taking charge by explaining to the others that since they’re five milers that they’ve come the wrong way, that this is for the other distances. Which can’t be right, because the sign makes no distinction about the distances. I decide phuck it and keep going, and they group of young women turns around and head back. That doesn’t feel right and though I normally like someone who takes charge and just makes a decision, in this case I think it might have been the wrong one. Not a good day to have cold, wet, and tired people lost in the woods. Meanwhile, more mud. Like, crazy amounts of mud. There’s one hill that just one big mud slick and with my VFFs, which have NO traction, I can barely get up. I have to grab onto shrubs at the edge sometimes just to stop from sliding back down hill. Then the trail, or what used to be a trail, goes through a swamp. Only now there’s no trail, just a clear area through the cattails. Some people have tried walking on earth clumps along the edge, but you can see their shoe prints where they slipped sideways into the water. So, nothing to do but walk right through the water, about knee high. Higher in some place. The only thing worse would be if there were leeches. It’s crazy, and kinda fun. I mean, it’s so absurd! We paid money to do this! Another mud bog, this one deep, which I remember this from last year. Back then, this was the only mud on the whole course. Now, it’s like a mud pond, and this whole section of trail is lined with brush rather than trees or forest, making side-stepping around any of this if not impossible, then time-consuming. The fastest way is right through the middle. And after I get out, my feet just look like lumps of mud. I can barely see the VFF shape. The good thing is that my VFFs are probably lighter than shoes at this point. The shod-heads must be carrying an extra 10 pounds on their feet. But, that mud bog means that we’re almost back to camp! And soon I can hear classic rock coming from the PA speakers. I bust out into the campground, onto one of the gravel roads, with people waiting there for runner loved ones, but who clap anyways. Around a bend, with more onlookers clapping and past the stage, which at this point doesn’t have a band. A race worker directs me into the proper chute, the one for people heading out for another loop, after drawing a black mark on my bib to denote one loop done. Inside the tent, which is ridiculously wet and muddy, there are tired and muddy-looking folks. One guy is just now opting out of the 100 Mile. The way Running Fit runs this is, if you DNF in one distance, they still give you a medal for the nearest distance you’ve run. So, for example, he’s still getting a 50 mile medal, though he doesn’t look happy about that. He looks like he just wants to go home and go to sleep after a good cry. I tell the guy in charge about the sign fiasco, and that there’s probably some confused runners out there. He’s not sure he should believe, even when the Wisconsin guy who I met at the beginning of the race seconds me. I walk away to take care of my stuff and hear the official say to another official that I’m the first one who’s said anything. Ok, fine dude. The people who turned around are still out running. The people like me who figured it out and probably more concerned with just getting on with the race, and/or they finished and just think the problem will solve itself. And they probably won’t want to sign up for this race next year. Just sayin’. Anyways, I dump my flashlight, gulp down one of the strawberry/banana smoothies, eat a banana, and grab two pretzel rods to nibble on. I also get two glasses of Gatorade, and some ramen noodle soup from the supply table. Also another piece of potato dipped in massive amounts of salt. Gack. And back out on the course for Round Two! My ‘split’ for the first loop was three hours. Not bad, if I could keep up that pace, but I’m betting my next loop will be more like four hours. Which means my third loop will be even longer, probably longer than five. So, 3+4+5=12, which was my semi-official goal, since that was about how long it took me to run to 50 in the Burning River. Ok. Maybe no PR today. Amazingly, now the first part of the trail is even more muddy. It’s had more rain, and hundreds of people pounding over it that it’s just a slippery mess now. Crazy stuff. Fair enough. A third guy kind of catches up to us, and we all run in silence for a while. Melissa actually steps up her pace a wee bit. That, or I’m getting slower, which could very well be, and pull out ahead of us, so we’re all running in single file, which again seems kinda odd on this wide trail. We’re now seeing people coming at us from the other direction, which just can’t be right. Not a lot, but a significant number. I don’t have the heart to even ask them if they realize they’re turned around. Hell they might not realize even after they get back into camp. I don’t know why I care so much, but I guess if just doesn’t seem safe to make people, especially beginners doing the 5 Mile, to run longer than they planned, especially in the rain. At this point I’m taking stock of my own pace, and my form. See, I’ve been feeling that my foot placement has been kind of sloppy. My feet seem to be ‘scruffing,’ not moving up and down exactly, but kind of sliding a bit as they come down, making noise, which to me is a warning sign: sound equals wasted energy for the barefoot runner. I’m thinking the desensitization from the VFFs and my tiredness are causing me maybe land either on my heels or maybe my toes rather than the whole foot. Meaning that my feet are getting sore. But...Maybe they’d just get sore after 16 miles anyway? Anyways, with this long sandy flat straight-away I try to concentrate on really getting a good form, bending the legs, lifting the feet in a steady 180/190 cadence, back straight, but trying also to relax. Bending your legs when you’re tired is actually kinda hard, but, without seeming to increase my cadence more than it had been, nor feeling like I’m exerting any more energy, I actually start to go a little bit faster, such that I pull out to the side of Melissa and gradually pass her. Seems like there’s less scruff and less soreness too. I at least sustain that along the bike trail, until it cuts back into the woods, though I’m going to try and keep consciously returning to good form for the rest of the race. Again, being tired will make that harder. As will the mud. I’m now starting to pop the ‘bloks’ and there seems to be an effect, in the sense that I seem to feel energy, while at the same time feeling a weariness with my body. That is, maybe and energy overriding the weariness? Not sure. Down through trails, and again we pop out on that larger dirt road with the two-way ultra traffic, with more of both 50 Milers already making the return trip on their second loops, and more zombie walker 100 Milers. It’s here that Melissa makes her move and passes me. Not much at first, I keep behind her, which is an amazing view, but she’s gradually pulling away. Alas my fair Wood Nymph, I think I’m losing you. Still, good for her, still going at a steady pace. I know I’ve slowed down, even with my attention to form. Will I see her on Loop Three? I’ve lost track of time. Feels like eight o’clock at night, but it maybe only noon. Crazy! And I’m only like half way! I’m feeling slow. I’m getting passed now, like the ‘tide’ has shifted, and if I started at the middle of the pack, I must be getting bumped towards the end. I know I was never going to ‘win’ but I feel like I could be stronger, maybe at least keep the pace I had for the first loop. But, after I hit the farthest aid station and make my way back along the two-way section, there are plenty of other 50 Milers behind me, looking pretty beat. If anything, the mud bogs are even deeper and more muddier. More rain, and more runners. Just trying to climb up Mud Hill I literally start to slide back downhill just trying to stand up. Then having to wade through thigh high muddy water for about fifty feet. It’s like a levee broke somewhere. But, that last big mud bog signals the nearness of camp! And, as I predicted, this split is about 4 hours. With most all the marathoners and halfers already done and gone by now, the crowd actually responds louder to my appearance. There’s even a band playing by now, so the field in front if filled with people watching, and they all clap as I go by. Feels good. Much needed boost. I’m feeling ok. I know this next loop is going to be tough, but I’m fairly sure I can make it. In the runners tent they have pinned up all the bibs of people who have dropped out, and they cover one tent wall. And, that’s just the people who dropped here at camp. It’s a lot of 100 Milers. No surprise. They’ve just been rained on for 15 hours. But there’s 50 miler bibs up there too. I restock my bloks, pound another smoothie, eat two bananas and a salty potato wedge. More Gatorade. Chicken soup. Sorry chicken! Thank you! And, two more pretzel rods to nibble. I’m still sweating, and still urinating, and the urine is clear, so that’s all good. Ok, onward! We crossed paths at last year’s Woodstock festivities, when she was running the 100 Miler, on, she tells me know, a broken foot. Today she’s been running the marathon (I think) but says one “hoof” was just bothering her too much, which is too bad. After being in my head for most of this race, it’s nice to talk to someone I even vaguely know, but when she finds out I’m in the 50 Mile and still have a loop to go, she shoos me off and I go. For what it’s worth, the rain has stopped and the sun is actually peeking through the clouds. Meaning it’s a little warmer. My wicking shirt is now almost dry. And with the sun out, the ground is drying amazingly fast. This first section of trail is now not really muddy at all, maybe just narrow sections up the middle. If there is any mud, it tends to be, no other word for it, sucky, meaning that it seems to want to hold on to my feet just a little bit more. Another guy comes out of the woods and stops. I say, “Yeah, the start is about a mile, mile and a half, back.” He nods confirmation. Doesn’t to me. I remember the 50K short cut being a long ways to go. But then, the 50K route is different than last year. Still, seems to me she’s not even on the course anymore. There are no flags at all on the road. What I think has happened is that she is one of the people who got turned around by the sign. Anyway, she doesn’t look coherent. The other guy and I tell her that we think she should be running on the trail with us, which I know makes us seem like a couple of know-it-all guys telling the woman what to do. She does follow for a little bit, but then decides it doesn’t feel right, so all I can do is say, “Cool, ok, Good luck!” But I’m thinking that race courses just should not be this confusing, to anyone. That other guy has taken off way ahead of me. Now I’m back to running alone, which is a strange feeling. I get out on the sandy bike path again, still scruffing along. My feet ache. Like, my arches just feel on fire. I’m just taking really small steps, trying to just keep steady and moving forward. Bending my legs is tough, even though when I do my feet ache less. But then my legs ache more. I’m trying to keep relaxed, but it’s hard to relax when you’re exhausted! Bend the legs: hurts. Straighten the legs: hurts. Breathe: hurts. No, actually telling myself to breathe actually helps in some way, maybe reminding me to keep to the basics. Still going on the small baby steps, with a cadence that maybe isn’t 180 at this point, but at least vaguely steady. A few more people coming the other way. Going slow and looking tired. I think they got more running in than they anticipated. I hope they actually say something to the organizers before they take off. So, no wood nymphs this time around. Nor even a lot of 50 Milers. Yep, I think I’m at the back of the pack. Who I find myself running with are the 100 Milers, all now on their last loops. Some are even passing me! One skinny scruffy old guy with a beard smiles as he passes. “Don’t let the jet blast from my wake knock you over!” Because he’s like going 2 miles an hour and I’m maybe doing 1.5. Who knows, but it’s nice to see someone keeping their sense of humor at that point. And he doesn’t have a pacer. Anyways, I end up kind of bumping back and forth with this guy doing the 100 Mile. Basically I’m just keeping a steady penguin waddle and I’ll pass him and his hottie pacer, but then that’ll cause him to get a burst of energy and he’ll overtake me for a little bit. I don’t think his pacer is going to get up to even a slow jog for the whole 16 miles, but bless her patience. I finally come around a bend and he’s spread out on a bench. I laugh and keep going. With the rain gone, and the heat, the air actually feels more humid now, strangely. And, the mosquitoes and horseflies have come out. You know it’s bad when you can’t even outrun mosquitoes anymore. To almost add insult to injury, a woman passes me power walking. She’s doing the 50 Miler, but says her legs has cramped up too much for her to run. Reminds me of Burning River, when that happened to me, except I wasn’t able to even walk that fast. Also, I remember another woman passing me at Mile 60 power walking, and then I saw her finish the next morning doing the same thing. For all I know, she may have just power walked the rest of the race. I gotta learn how to do this. I think this is where having shoes actually helps, since the key to powerwalking seem to be to get the heel to toe roll, which I can’t, and don’t want to, do. But the arm swinging seems to help. I’m walking up even slight hills now, and this seems to speed me up a little. So, thank you Powerwalking Lady! Onward. Trudge trudge trudge...Mud mud mud. I still have to wade in the water on the back end. The people at the aid stations have traded out, new faces. One bearded guy calls me by name, telling me to keep it up. I think he might be a friend of Jason’s. A friendly touch though. I’m kinda too delirious to strike up a convo at this point though. Mud bog, where is the mud bog? Mud bog means home. John need mud bog. John need home. John need sleep. There! There is mud bog! I walk right through the middle, my mud flaps making me look like a muppet at this point. Hi ho, Kermit the Frog here, on the planet Koozebane. Man, I’m groggy. But a mile and a half left. Time to leave everything on the course. I run. I even go a little faster than a trudge. Amazingly, this far into the day, there are even more people waiting when I pop out into camp. I know, or I think, that they’re awaiting people they know, but the applause is enthusiastic and genuine and a good last boost. I’m actually feeling a little choked up, like I could almost cry. I round the bend, more clapping, and the whole camp starts clapping and giving me ‘good jobs’. I wave and try to give a good strong finish. If not a sprint, then I at least have enough energy to jump up and land right on the timing pad, which the crowd seems to like. And then, that’s it. I get my medal. The woman asks me my age, and no I haven’t qualified for any prize for my age category. Didn’t finish in the top five of my category even. That’s fine. I’ll take the finish. Time? 12:30. So, about what I predicted, and good given the course conditions. The runners tent is gone, looks like they took it down to lay it out in the sun to dry. My bag is one of the last one’s left. Even the food table is gone. At least I have one last banana! And a protein smoothie! I hate to do it, but I have to check the feets: Yep, a big ole blister on my right foot, right where the ball and big toe meet. I thought I could feel something burning in there. My Injinji socks are just trashed, holes in all the toes, soaked in dirt. They just going in the garbage. For my VFFs fortunately one of the women working there finds me a plastic bag. They’re so muddy I don’t even want to throw them on the floor of my cab. And yeah, kind of anti-climatic. I take a cool down walk around to see if anyone I know is still here, like Jason or Sweet Melissa, but don’t see anybody. Lots o’ people still camped out though. As for me, I have a bed calling my name back in Jackson. Goodbye Woodstock! Goodbye Hell! Well, to finish, and hopefully get under 12 hours. That didn’t happen, but I’m fine with it. I wanted to be better about nutrition, and I think I did that. I was still sweating at the end, and had energy to drive home. This was also a lot cooler than Burning River though. The weather was crazy and uncontrollable. I did not expect to get a blister from the VFFs, but it didn’t hinder me in any way. I thought wearing socks would prevent that, but I also actually hadn’t run with this pair in a while, opting for some newer ones, so if I know I’m going to be using a pair in a race, I should stick with that one pair. I probably could have run at least one loop barefoot, but super slow, and I just do not want to be any more slower than I already am. Yes, I think going minimalist makes me run more sloppy, which probably causes some foot ache, yet I think my feets would be aching anyways. There’s a temptation to consider wearing something like racing flats, something with some cushion, but when I think about it, I don’t think it’s lack of cushion that makes my feet hurt, and seeing that 100 Miler guy I was running with come in right when I’m leaving me is a good reminder of the horror of shoes, since his toenails are falling out. No way. I’ll take my achy feet.